When kids are involved, muddy shoes are all but guaranteed. Don't stress about the damage caused by dirty kicks, or spend the whole day cleaning up afterward. Use these protective covers to make it impossible for your seats to get dirty in the first place. This handy two pack comes with one cover for each front seat, and once installed, they will provide a barrier to keep the surface clean. 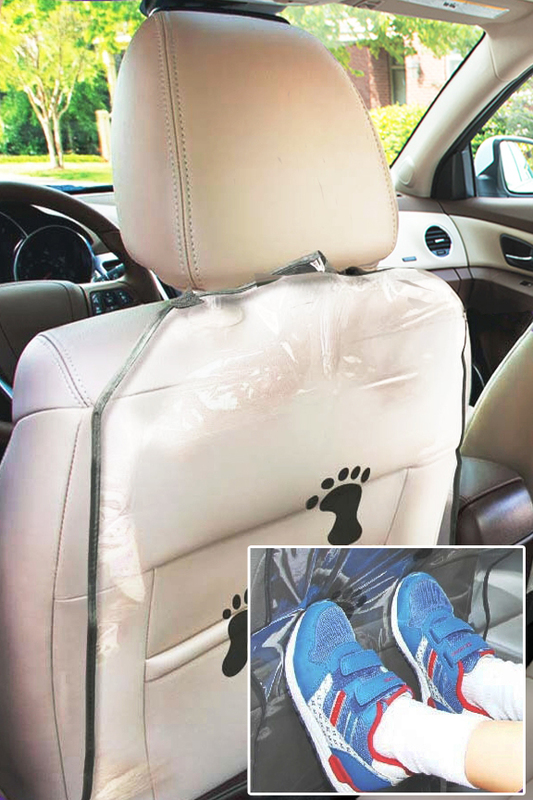 Children can kick and scrape without causing damage, and unlike leather, fabric, vinyl and other common materials used to make car seats, it'll wipe clean in seconds. Simply secure the top around the head rest, and then use the elastic strap to attach the lower portion at the base with a snug fit. Once in place, it will guard almost every inch to keep your seat looking like new. The clear front allows it to blend with any interior, so it won't stick out or look ugly as it keeps your car clean. The durable material will not absorb odors or stain, and it's designed for everyday use, so it won't wear out or fail like flimsy alternatives sold elsewhere. Perfect for spring when muddy feet are an everyday occurrence, but also nice for winter to block salty slush, or in summer to keep sand and other debris off of your upholstery. Get for occasional use when camping or traveling, or install on a full time basis to keep your car spotless no matter who is traveling with you. Don't struggle to get your car seats clean after the fact. Stop dirt dead in it's tracks, and never let it touch the material at all. Top Quality. Strong materials, durable straps and thoughtful construction ensure a product that will last. Lower quality items that look the same will fail quickly or wear out with minimal use. This high quality alternative will remain securely in place and work like new, even with repeated use. Universal Fit. Designed to work on any bucket style front seat, these protectors will work in all sorts of cars, trucks and vans. The universal design easily adapts to slight variations in seat size and shape. Easy-To-Use. Just slip in place and make sure the straps are secure. Installing this product is incredibly simple, and only takes seconds. Once in place, the fool-proof design will block muddy feet reliably without any other steps necessary. See-Through. Cover the material without affecting the look of your vehicle. The clear front allows the seat color to show through, so once in place they're hardly noticeable. Large. Other products that look the same are smaller in comparison. These large protectors will cover more surface area to protect the whole seat, instead of just part of it. You can't guess where their toes will touch, so protect the entire area for increased peace of mind. Washable. A damp rag will wipe away the grime they collect in most cases, but you can also use your favorite spray cleaner, remove to hand wash, or machine wash without drying. The specialized material won't hold onto dirt, so mud and other yucky stuff will come off with little effort to keep it looking like new. 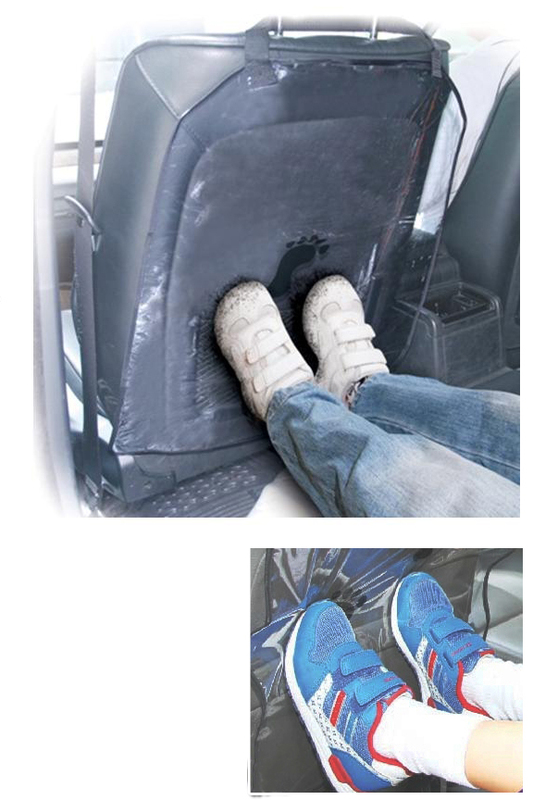 Fully compatible with almost any vehicle, this protective cover is simple to install. Once in place, it will provide the perfect solution to muddy shoes and other dirty disasters. To prepare, unfold and lay flat. There are two straps to secure it in place, one at the top, and one at the bottom. The lower strap is elastic, and the one at the top is not. To install, place the top strap around the support for the headrest, and then place the lower strap around the base of the seat at the lumbar location. The elastic will ensure a snug fit, but you may need to re-position for ideal coverage. To remove, simply pull up and off the seat. To clean, wipe with damp rag. Attachment Method Two straps (top and bottom). Adjustable Yes. Auto-adjusts for a snug fit thanks to the elastic lower strap. # In Package 2 - One for each front seat. Never worry about dirty shoes again. Kids can't help themselves, so make it impossible for them to get your seats dirty. Completely cover the back of your front seats to keep them clean no matter who is in the backseat. Order Yours Today!